In a large bowl, beat cream cheese, powdered sugar, and Nutella until light and fluffy. Fold in 8 oz. (one container) Cool Whip until fully combined. Add six chopped Ferrero Rocher chocolates and mix to incorporate. Fill the pie crust with mixture and smooth top. Freeze for 1 hour to set. To serve, top with remaining Cool Whip. 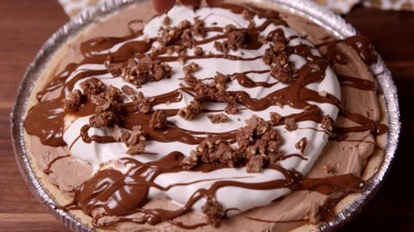 Drizzle with Nutella, then sprinkle over remaining chopped Ferrero Rocher chocolates.